The tasks of bioacoustics, in regard to both research and operational activities, call for specialized sets of instruments which are not commonly available on the market. This is why it is often necessary to design, assemble, and test new instruments and methodologies for both the acquisition and the analysis of the signals. Our research on cetaceans in the Mediterranean is carried out using instruments and techniques of advanced (and original) design whose development is an activity of the Laboratory of Marine Bioacoustics. A great effort was put in the development of digital systems for sound analysis and for supporting the researcher in the measurement and understanding of infrasonic, audible and ultrasonic signals. Managing signals in a digital domain allows new approaches, easing filing and flexible analysis of sounds, including real-time spectrographic analysis and display. The microphone has the crucial task of converting pressure variations (sound pressure) into a modulated electrical signal. This electrical signal can be amplified, recorded, analyzed, and truthfully represents the acoustical pressure that generated it. Two main transducer types exist: dynamic and condenser. Dynamic microphones are very robust, reliable and don't require anyu powering, but they are less sensitive than condenser microphones. Condenser microphones are more sensitive and with mnore extended frequency response, but require some powering. Some miniature condenser microphones can be powered with low voltage supplied on the plug (PIP - Power In Plug) of consumer recorders (some DAT recorders and MD recorders). Professional microphones are normally powered with 48V by using the signal cables (Phantom Powering); only few models have an internal battery to provide power. Phantom Powering is normally provided by professional recorders, preamplifiers and AD converters; in case a device can't provide powering, battery powered supplies must be connected among the microphone and the device. Main parameters that characterize a microphone are type of transducer, efficiency (or sensitivity), self-noise (its intrinsic noise), frequency response (the range of frequencies that is able to receive) and polar pattern (or directivity). All these parameters are equally important: among them the polar pattern is a graphic representation of the sensitivity of the microphone with respect to the frequency and the angle of incidence of the sound. Typically, directionality increases with increasing frequency, i.e. decreasing the wavelenght. There are three basic directional patterns: omnidirectional, bidirectional and unidirectional, or simply directional. The basic directional pattern is the cardioid one which correspond to the simpler design to make a microphone directional. Among directional microphones, the most useful in bioacoustic recordings, microphones with various degrees of directionality are named as super-, ultra- or hyper-directional; the most directive are called shotgun because they are shaped as a long tube. Sennheiser produces a series of condenser microphones with different polar patterns highly appreciated for recording wildlife. Two product lines are available: the cheaper one has a modular design with a common preamplifier body and interchangeable capsules (K6 series); the most sophisticated and expensive is the line of MKH models that offer very low noise and high reliability in field use because of the special design of the condenser transducer. A more complete analysis of microphones can be found in a number of books on acoustics and electro-acoustics. Hydrophones are sensors that transduce sounds propagating underwater into an electric signal. Whilst microphones are made with a membrane whose vibrations are converted to electrical signals by means of a dynamic or condenser system, hydrophones are made by a piezoelectric element that produces a current when compressed by a sound wave. Regarded as single transducers, hydrophones are usually omnidirectional and typically cover a wide range of frequencies, from a few Hz to more than 100 kHz. In the marine environment, different and more complex hydrophonic systems are used. They consist of multiple transducers (array of hydrophones) in order to be more directional and sensitive. As far as the application in underwater bioacoustics is concerned, there are two main kinds of utilization of the transducers: stationary mono/multi-hydrophonic configurations by which to control selected areas, and towed hydrophonic arrays to continuously detect sound during navigation. Towed arrays allow continuous survey in large areas while navigating. Visit the page Underwater bioacoustics equipment for more information on underwater acoustic technologies. Directional microphones and parabolas help sound collection in nature by giving emphasis to the sounds coming frontally and attenuating unwanted ambient noise. This is useful to focus on a single source, for example a single bird, while attenuating unwanted songs or noises coming from other directions. This type of recording is called "species recording" and often it is a monophonic recording; on the contrary an "ambience recording" is a recording of all sounds of a specific environment. Ambience recordings are usually stereophonic to reproduce the position of all sound sources; for this purpose many different techniques exists, each one with its peculiar features. In both cases the recordist has to face with many problems, the two most important are wind and noise coming from human activities (road traffic, even if roads are far, airplane noise, and maybe noises from other activities). Wind noise can be attenuated with proper wind shields on the microphones. A parabola focuses sound waves coming from a direction parallel to its axis onto a single point, the focus, where an omnidirectional microphone is placed. Its effectiveness is determined by the diameter of the reflector in relation to the wavelenght of the sound: its gain and directivity increase proportionally with increasing the diameter/wavelenght ratio. For wavelengths larger than the diameter of the parabola, the response is predominantly that of the microphone itself. Increasing the frequency, as the wavelenghts become smaller than the parabola's diameter, gain and directivity increase as the frequency increases. For a parabola to became effective at frequencies as low as 100 Hz, its diameter must be larger than 3 metres. Common diameters are 45 cm, 60 cm and 90 cm with directionality starting respectively at about 750, 550 and 375 Hz. Specific design, well matched microphones, proper positioning and proper filtering allow to linearize the in axis frequency response of the whole system. Most recordings made with parabolas are monophonic, but recently new stereophonic models provide more pleasant and realistic recordings. Parabolas made by Telinga are among the most advanced tools for wildlife recording. Ultradirectional microphones, also called shotgun microphones, are cardioid microphones fitted with an interference tube on their frontal face. The shotgun microphone is characterized by a flat frequency response, is less sensitive to wind and handling noise but offers a lower sensitivity than a microphone mounted in a parabola; the interference tube cancels off-axis signals while the in-axis signals reach the microphone's diaphragm without attenuation nor gain. Normally, these microphones are condenser microphones. It is possible to use pairs of shotgun microphones to produce stereophonic recordings. An alternative to using two directional mics is to use an ultradirectional microphone coupled with a bidirectional (figure of eight) microphone that provide some spatial information. By combining the two signals (MS encoder/decoder) it is possible to produce a stereophonic image while maintaining the "focusing" effect of the directional mic. Ultradirectional microphones made by Sennheiser are among the most appreciated for wildlife recording because of their performances (low-noise) and also of their reliability in field use. Ambience recordings are normally made with couples of microphones to capture spatial information. Different techniques can be used: binaural, ORTF, MS, XY, SASS, and others. Normally, microphones used for stereo recordings are omnidirectional or moderately directional (cardioid), but pairs of ultradirectional microphones can be also used to focus on a direction whilst attenuating noises coming from other directions. In this type of recordings, if made in very quiet environments, it is important to use microphones with low self-noise. Whilst not important for recording loud sounds, for example a rock concert, self-noise is one of the most important parameters to evaluate for nature recording. Self noise is normally expressed with a dB value either A-weighted or linear. The quietest microphones have a self-noise in the range 5-10 dB(A). Normal microphones may have a self noise as high as 22-25 dB(A), too much for ambience recordings. Of course a quiet microphone should be coupled with a recorder with low-noise electronics (low-noise mic preamplifiers). Sound recorders can be analogical or digital. They allow recording an electrical signal generated by a proper transducer, a microphone, an hydrophone, an accelerometer, or produced by another instrument, a synthetizer, a radio receiver, or another recorder. A recorder must record a signal without alterations by at least matching its dynamic and frequency range and by preserving all its features. Traditional analog tape recorders, both compact cassette and open-reel recorders, degrade the signals they record by adding hiss, distortion, frequency response alterations, speed variations (wow and flutter), print-through effects, and drop-outs. Open reel recorders are much better (heavier and more expensive) than cassette recorders because of higher tape speed and also beacause of larger and thicker tape. Digital recorders get rid of all these problems and have almost completely replaced analog recorders. Within the dynamic range and the frequency limits due to the number of bits and sampling frequency they use, they record and reproduce signals with great accuracy, low noise, flat frequency response, and no speed variations. Also, digital audio data can be directly managed, stored and processed by means of either dedicated or general purpose computers, including personal computers like Macs or PCs. The DAT (Digital Audio Tape) standard is based on 16 bits of resolution and a sampling frequency of 48000 samples/second to allow, respectively, about 90 dB of dynamic range and a frequency response of 10Hz-22kHz. Some DAT recorders allow two additional modalities: 16 bit at 44100 s/s to allow direct mastering of CDs and 12 bit at 32000 s/s to double the recording duration of the tape. The DAT recorder delivers a sound quality slighty better than CD in a small, easy to use and easy to store, long duration, tape-based format. And, since DAT has become a mastering and audio backup standard, it's easy to exchange tapes with other studios and musicians. Also, digital transfer to and from a computer allows duplication, editing and analysis in an entirely digital domain. Digital transfer from DATs to computers is allowed by specific boards with digital I/O capabilities. ...but not even DAT is perfect! ...Both recorders and tapes require care and tape duplication is a safe measure to preserve valuable recordings. Recordist must be aware of the requirements of their intended analysis and of the limitations due to their entire recording chain (acoustic transducer + cables + recorder + tapes). While it is important to choose components carefully for their specific individual features, it is essential that their combination result in an optimally functioning system. DAT recorders deal mainly with audible signals: their frequency response allows very good recordings from low frequency signals, as low as 10 Hz, up to 22 kHz. Unfortunately, they can't be used to record ultrasounds: for frequencies higher than 20 kHz specific and expensive instrumentation recorders are required. DAT recorders with doubled speed and 96k s/s were developed to record and play two channels with 40 kHz bandwidth; other DAT models offer four channels with 20 kHz bandwidth or 8 channels with 10 kHz bandwidth. Though, we have to consider that consumer DAT recorders are disappearing as they are replaced by MiniDisc recorders and MP3 recorders, at least in the huge consumer market. Professionals concerned with high quality sound recording still deal with expensive professional DAT recorders and also now consider new emerging technologies such us optical disk recorders, solid state recorders, hard-disk recorders and laptop-based recorders. These two digital media have been developed more than 10 years ago to provide the consumer market with digital performance at a low-cost. The DCC had no success even if it offered the ability to play old compact cassettes to allow a smooth transition to the new technology. On the contrary, the MD is still alive with some very attractive features such us small size, low cost disk, random access, easy connection to a PC. MD recorders delivers digital quality, but are based on sound compression algorithms that in some way degrade the sound they record. Sound compression algorithms are based on the statistical features of musical programs and of human hearing: they discard all sound details which appear to be non audible in relation to the sound program and the perception model of human hearing. Anyway, they appear to sound better than traditional, analog compact cassettes. For these reasons, even if they appear to be good with traditional sound programs, like music and speech, they are not suited to record sounds (animal voices, for instance) whose features don't correspond to the models on which compression algorithms are based. Even if the recordings appear to be good for our ears, sound details may have been degraded by the compression process. The same considerations can be done about MP3 recording now widely available with small HD recorders and solid-state recorders. To get rid of the MD limitations a new standard has been developed: the new HiMD recorders can record in uncompressed .wav format on 1GB MD discs, but they are still limited to 44.1kHz sampling. The latest models from SONY allow to digitally transfer the recordings to a PC without any loss of quality. Among them, the latest SONY MZ-RH1 seems the best suited for field use. It is important to consider that MD and HiMD recorders don't provide 48V powering for professional microphones and thus they require an additional battery powered P48 power unit. By using a parabola+mic with high output level, such as the Telinga, or good microphones powered with a separate P48 battery unit, such as the Rolls PB224 or Art Phantom II, it is possible to get results that compete with those of more expensive recorders and largely surpasses most cheap solid state recorders. To know more about MD and HiMD recorders, visit the MiniDisc page. These recorders try to get rid of the limitations of all the mentioned recording equipment. They record on internal hard-disks or on memory cards such as the same compact flash memories used in digital cameras. They can record in either compressed or uncompressed formats to privilege recording duration or quality; some models can record up to 192kHz, and some record up to 4 channels. Some are pocket-sized and others have the size of a book. Some are music oriented and may miss many of the features required for scientific recording. Among those suited for field recording we can mention the following models: Marantz PMD 660, 670 and 671; Fostex FR2; Edirol R1, R4/R4Pro and R09; M-Audio MicroTrack 2496; Sound Devices 702, 722 and 744; Tascam HD-P2, SONY PCM-D1. See table for comparison details; jump to our technical tests' page for further details and measures we made on some of these devices. New interesting devices are likely to appear in the new future. Other then these, there are field recorders made by Nagra and by other brands that are really expensive (DEVA, AATON CANTAR, Sonosax and others). Each one has its own features and often it is not easy to choose one because specifications given by manufacturer are confusing, in particular those related with the noise of the microphone preamplifiers. Almost all are suitable for recording loud concerts, but few are quiet enough for recording low level sounds. The self noise of the microphone and of the recorder limit the possibility to capture low level sounds in quiet environments, or at least add annoying hiss. Among the mentioned devices, the Sound Devices 7xx serie has the best reputation for reliability, flexibility and overall sound quality, in particular for the low noise mic preamplifiers. As far as self-noise is concerned, latest HiMD recorders can compete with the best solid state recorders but require an external unit to provide phantom power to professional microphones (see the MD chapter). requires a PocketPc with Live2496 software for recording to CF/SD, or a notebook/subnotebook. Please consider that this table is just a list of available devices. Each one with its own features, advantages and disavantages to be carefully evaluated according to research needs and available budget. New portable models are expected to come out in early 2007: the Fostex FR2-LE, the Korg MR1 and MR1000. The Korg units adopt the 1-bit technology already used for DSD (DirectStreamDigital) Audio and SACD (SuperAudio CD); a specific software will allow to convert 1-bit audio sampled at 2.8MHz (5.6MHz in the MR1000) into the desired PCM audio format 48/96/192K with either 16 or 24 bits. Theoretically this technology will allow to get almost any frequency range just by software processing of the original stream; the declared bandwidth in DSD 2.8MHz mode is 100kHz without the aliasing problems normally introduced at frequencies close to the Nyquist frequency (half of the sampling rate) in traditional PCM converters. The drawback of this technology is the high frequency noise introduced by the AD conversion; the noise is inaudible but, for bioacoustic needs, may reduce the usable dynamic range at ultrasonic frequencies. Further options are given by PDA (Personal Digital Assistant) based recorders; by interfacing a microphone preamplifier and AD converter to a PocketPC PDA, running either Linux or WindowsMobile, it is possible to record on the PDA memories, either SD or CF, and then easily move the recorded files to a traditional PC. The only interesting solution now available is proposed by Core Sound (other solutions are limited to speech recording); a PDA recorder may offer the same quality of an off the shelf recorder, it may offer a greater flexibility, but it is important to mention that assembling different pieces of hardware, connecting them and providing power might be difficult, in particular in severe field conditions. The image at left shows the PDA unit assembled at CIBRA with Core Sound components (Mic2496 preamplifier and AD converter, PDAudio CF card, Live2496 software). The PocketPC can be replaced by a solid state recorder, provided it has digital input without digital resampling. A viable option is to use the M-Audio MT2496 just for storage. Very interesting discussion about recorders and microphones are available in the "naturerecordist" email discussion list on Yahoo. Recording on a PC, either desktop or laptop, may have great advantages. Sound devices for both laptops and desktops are now available with 192k s/s to provide more than 80 kHz of useful bandwidth while dedicated instrumentation acquisition boards can sample up to 500k s/s to get ultrasounds up to more than 200 kHz. For laptop use, USB and FireWire sound devices now allow up to 8 channels at 96k s/s and few models go up to 192k. A 80 GB hard disk can record for about 120 hours with DAT quality (16 bit, stereo, 48kHz) or 60 hours with doubled bandwidth (16 bit, stereo, 96kHz); larger disks and RAID controllers available on desktop PCs can allow to record for weeks. Even if the use of computers for recording, analyzing and editing sounds has been experimented since 25 years ago, only in recent years the PC capabilities and the availability of good and cheap sound devices and huge hard disks have made computers powerful and affordable enough. The new generation of subnotebooks and small tablet PC could boost the interest in computer recording in the field. Advantages given by laptop recording are: wide choices of sound inputs, sample rates, number of channels; recording duration benefits of huge HDs, ability to schedule recordings, wide filenaming capabilities (timestamp, location, gps position, etc. ), sound streaming over either wired or wireless networks, etc. Unfortunately most built-in sound interface are not as good as we would. Thus in most cases it is required to connect to an external sound input device, USB, FireWire, or PCMCIA. As for recorders, the critical part is the sound acquisition front-end made by microphone preamplifiers and AD converters whose specifications are often not clear enough. The page Tech Tips, Tricks and Tests shows some results we got while testing audio interfaces and sound recorders for our lab. Besides sound quality, it is also important to use equipment suited for field use. There are many USB devices, some of which are powered through the USB bus; FireWire devices can be powered by the bus but not all FW sockets in laptops do provide power. There are few other solutions based on PCMCIA boards that may have an external box; some of these external box require external powering. In all cases where external powering is required, if field use is required it is important to verify what type of power is required (V, mA, and if DC or AC) to provide a suitable battery system for the field. An optimal choice for field use is when a DC current is required in the range 5 to 12V. AC powering or higher voltages require more expensive and complicate solutions. The photo shows the Digital Signal Processing Workstation developed by CIBRA in 1996. A Sony DAT D7, optically connected to the Opcode DATport, the first USB device able to allow the direct digital transfer from a DAT to a PC file. Now most audio interface include a digital port, either electrical or optical. Visit the pages Development of instruments for sound recording and analysis and Tech Tips, Tricks and Tests for technical details and special information on the equipment we use. Instrumentation recorders are typically suited to record signals whose frequencies are lower or higher than those audible by man. Often these instruments allow recording several independent channels at the same time (multi-channel recorders) and have several tape speeds to be selected in relation to the frequencies to be recorded: higher speeds to record higher frequencies. To record frequencies up to 100 kHz, analog recorders run the tape at speeds up to 76 cm/s. Ultrasound recordings can be played back at reduced tape speed to be made audible, to be analyzed or to be recorded on conventional audio tape recorders. Instrumentation recorders designed to record ultrasounds are very expensive and not well suited for field use; thus, cheaper devices to detect and possibly record ultrasound were developed to study echolocation in bats. These were called bat detectors. A special class of instrumentation recorders is based on FM recording. A carrier is frequency modulated by the incoming signal and then recorded on tape: when playing back the tape a demodulator extracts the original signal. FM recorders have a bandwith typically ten times lower than comparable direct recorders and are well suited to record very low frequency signals. FM recorders have been replaced by DAT recorders modified in their I/O circuitry to accept very low frequencies, down to the DC. Special DAT recorders have been made to record more than 2 channels at the same time by splitting the DAT standard bandwidth into up to 16 independent channels. Tape based instrumentation recorders are being replaced by dedicated or general purpose PC systems equipped with suitable data acquisition interfaces and large hard disks. PC based systems can acquire and record signals from 0 Hz to many MHz. A special feature of all instrumentation recorders is that they are "calibrated"; this means that they record a known voltage range and their input level settings are calibrated. With a calibrated recorder connected with a calibrated microphone (with a known pressure/voltage sensitivity), or hydrophone, it is possible to accurately measure the received acoustic pressure by reading the recorded "voltage" and converting it to the received acoustic pressure. In recent years instrumentation recorders have been replaced by either dedicated recorders or PC based recorders. Bat detectors were developed to provide researchers with cheap instruments to study bat echolocation. Bat detectors are based on both analogic and digital techniques to detect and record ultrasounds. Three main systems are actually used by the detectors available on the market: heterodyne frequency shifting, frequency division and time expansion; the most advanced instruments have all these three systems to make ultrasounds audible and recordable, with some limitations, on usual audio recorders. Direct and continuous recording of ultrasounds requires expensive instruments not well suited for field use. Heterodyne detectors allow to shift a small frequency range, tipically no larger than a few kHz, down to the audible range; the user tunes the detector to the frequency of interest and then he listens to and records only signals whose frequency is around the tuned frequency. Anything outside that frequency range is lost. Frequency division (or count-down) detectors cover a very large frequency range and are basically Zero Crossing Detectors. The output signal from these has a frequency which is a fraction of the original frequency (e.g. one tenth). The most advanced retain the amplitude envelope of the original signal. These two systems allow recording an audible representation of an ultrasonic call, not of the full ultrasonic signal structure. The time expansion detector is the most accurate system: it retains all of information of the original signal. The ultrasonic signal is sampled at high speed and digitally stored into a memory; then it is replayed at a lower sample rate, e.g. one tenth, to be made audible and recordable with traditional equipment. If the stored signal is replayed at a sample rate ten times lower than the original one, frequencies are reduced by ten while time is expanded by the same factor. Unfortunately, this kind of instrument allows to store a few seconds only. To store more time of ultrasonic signals, large memory expansions are required. 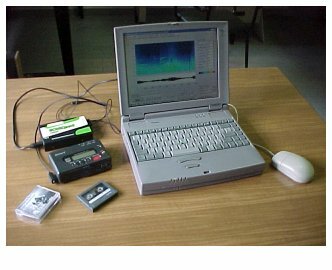 The systems suited to record long sequences of ultrasonic signals are the traditional high speed tape recorders (instrumentation recorders), very expensive and requiring a lot of tape unless they use VHS video tapes, and PC based digital signal acquisition systems with fast high-capacity data storage. The recordingo of ultrasounds can be now easily achieved by means of a laptop computers with a fast sound sampling board. Sound boards with 192 kHz sampling are now available to record ultrasounds up to 85-90 kHz. Among PCI boards, the Lynx Two model is highly appreciated for its flat frequency response up to 90 kHz and the steep anti-aliasing filters; also, by using our SeaPro Ultra software, this board can be set to run up to 200 kHz of sampling rate to provide 95 kHz of usable bandwidth. For portable use there are either FireWire or USB devices that claims 192 kHz of sampling rate, but some have a frequency response limited to 50 kHz and poorly designed anti-aliasing filters. An alternative to computer recording is offered by few solid-state or hard-disk recorders that can sample at 192 kHz; three models are now available, two CF recorders (Fostex FR2 and Tascam HDP2 and one with both internal hard-disk and CF (Sound Devices 722/744). To further increase the recording bandwidth it is necessary to use very expensive dedicated recorders or high speed data acquisition boards connected to a laptop or to a desktop PC. With those boards it is easy to record at up to 1Msample/sec. National Instruments provide a broad range of data acquisition devices with PCI, USB, PXI, PCMCIA and FireWire interfaces. Normally these devices don't have anti-aliasing filters on board and thus it is required to add an external a-a filter to each channel; this greatly increases the cost of the acquisition system. Additional costs should be also taken into consideration to properly interface the board to the sensors and to develop or buy a recording software suitable for your needs. Visit the page Tech Tips, Tricks and Tests to learn more about the performances of 192 kHz devices or the page Development of instruments for sound recording and analysis to discover the equipment we developed. A new device for recording ultrasounds has been developed by Dodotronic: it is an ultrasonic microphone with integrated high speed AD converter and USB port. Two models are available: Dodotronic UltraMic200k and UltraMic250k, both can be connected to a laptop PC and with our SeaWave and SeaPro software it is possible to record ultrasounds to the internal hard drive, to see on the spectrographic display and also hear them shifted down to audible range. Sound analysis allows to display the features of acoustic signals graphically, and, thus, to understand and measure their structure and to correlate it to observed species, behaviours and situations. Spectrographic representation of animal voices has been widely used since the first analogical analysis instruments were developed for military acoustic research. The transformation of signals in the digital domain allows a new approach in the management of the data, thus easing operations of filing and analysis in connection with both the listening and the real-time display of the signals. The development of digital signal processing techniques and high-speed hardware at relatively low-cost has actually made the visualization of acoustic signals an every-day invaluable tool for bioacoustic research and for educational purposes. A number of analysis techniques are available; usually, they are based on dedicated digital systems or are carried out with general purpose computers equipped with suitable analog-to-digital conversion devices and specific Digital Signal Processing (DSP) software. The simplest graphical displays are the oscillogram, which shows the waveform of the signal, and the envelope, which shows the amplitude of the signal in regard to time. The most significant analysis is, however, the spectral one, since it shows the composition in frequency of the signals: the instantaneous spectrum (frequency-amplitude plane) shows frequency components of a short segment of a signal, while the representation of more spectra, computed on consecutive or overlapping segments of the signal, shows the evolution in time of its frequency structure; graphically this is achieved by showing the spectra in an ordered time series, representing them, for instance, on an axonometric diagram, in a three dimensional space (frequency-amplitude-time). The most effective, compact, and easily understandable display is the representation of the signal on the frequency-time plane, with the component intensity coded through a scale of greys or a suitable colour scale. This kind of analysis is usually called spectrogram, or SonaGramTM since it was first realized by the Kay SonaGraphTM, and is largerly used to analyze animal sounds as well as the human voice. Since spectrographic analysis, actually based on the windowed FFT (Fast Fourier Transform), is unsuited to analyze some non-stationary signals due to the uncertainty principle, several other processing techniques (zero-crossing, wavelet, wigner-ville) have been developed to resolve the frequency-time structure of complex signals or to accomplish particular tasks. Using graphic representations, one can easily compare various signals in order to find similarities or differences between them, to classify signals in regard to their morphology, related behaviours, supposed meanings or individual emittors. Visit the page Software for real-time sound analysis to learn more about sound analysis software developed at CIBRA. Several instruments on the market allow to analyze animal sounds; most of them can acquire and store a signal segment to be later processed, analyzed, displayed and/or printed in one or more graphical formats. Such an instrument can easily be a personal computer, a MacIntosh, a IBM-compatible equipped with suitable hardware and software. Basic hardware must include Analog-to-Digital (AD) and Digital-to-Analog (DA) converters with at least 16 bit resolution, selectable sampling frequencies up to 50000 s/s to allow analysis up to 22 kHz, and sharp low-pass filters to avoid aliasing, that is the "pollution" of the frequency range of interest by frequencies higher than the Nyquist frequency, which is half the sampling rate. More advanced and expensive equipment should include fast CPUs and highly optimized software to perform in real-time, fast AD/DA boards to acquire ultrasounds, a DSP board to speed-up some intensive computation (present CPUs are so fast that in most cases dedicated DSP processors are no more needed), a digital I/O board to directly connect an external digital device such as a DAT recorder or any other recording device with digital I/O. Recently, the diffusion of the Windows environment and multimedial applications has widened the interest about digitized sounds and many excellent AD/DA sound boards are now available to provide up to 192k s/s sampling with 24 bits of accuracy. As hard disk can now store up to 160GB in the 2.5" models and up to 500GB in 3.5" models, recording on laptop and desktop PCs can be an effective alternative to the use of expensive stand-alone audio erecorders and instrumentation recorders. A number of programs running under Windows allow to record, edit and play-back sound files, although only few of them allow to visualize in detail their acoustic structure and can be effectively used for bioacoustic research. The software developed at CIBRA has been developed for bioacoustic research and provides real-time sound analysis capabilities and continuous recording to hard disk. Visit the CIBRA equipment page for further details. A huge amount of valuable first-hand information is also available by joining the Naturerecordists and Laptop-Tapers email discussion groups on YahooGroups. There you can find information about other professionals and amateurs have setup their equipment to get the best compromise among cost and required features.